Am I the only one who was surprised to not hear members of West Virginia’s congressional delegation jump out to immediately slam the Obama administration’s new proposal to reduce toxic air pollution from coal-fired power plants? Maybe I missed it. But I didn’t see or hear a word yesterday out of our Senators and House members. And nothing this morning, either. 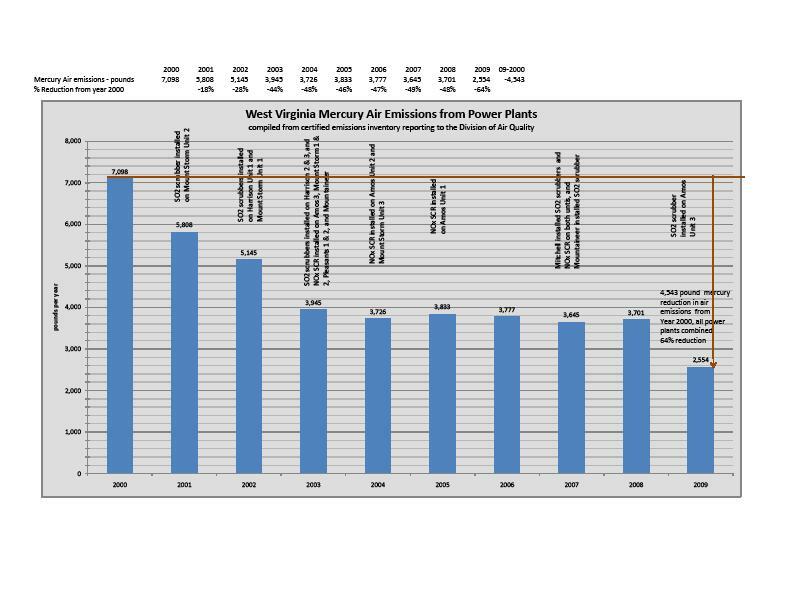 For your information in reporting about the situation in West Virginia, the WVDEP’s Division of Air Quality is providing a chart showing the amount of mercury reductions that have been achieved by coal-fired power plants in West Virginia in the last decade through the use of controls installed to comply with air rules aimed at reducing air pollutants other than mercury. The attached bar chart shows that from 2000 to 2009, coal-fired power plants in West Virginia reduced mercury emissions by about 4,500 pounds, or 64 percent. There’s the chart, or you can click here on WVDEP’s Web site to view it in another format. We aren’t taking sides, just providing factual information about the current status in West Virginia, in case writers want to localize the story. Those who have opinions regarding the issue could use this information either way, really. One could interpret this to mean that new regulations aren’t necessary, while the other side could point to this and say, look at how successful previous regulations have been – we are on the right path. I was left wondering, though, why WVDEP didn’t also release any sort of information about the public health effects of remaining mercury emissions from power plants or about the impacts of the other toxic emissions that the EPA proposal aims to reduce. Cosco told me that WVDEP just say the EPA proposal for the first time yesterday and is just starting to review it. She said agency officials don’t know yet how many West Virginia plants already comply with the proposed emissions limits. But a very quick review I did this morning of EPA Toxics Release Inventory data indicated that the vast majority of the mercury reductions touted in that EPA chart came from a small number of West Virginia power plants that have over the last decade installed advanced pollution controls. The knee-jerk reaction from some is obviously to complain this is just another example of how the Obama administration is out to get the coal industry or how EPA is going to cause all of our electricity rates to skyrocket — or if you don’t like coal, how the rules might help strangle the industry out of existence. Power plants are the largest remaining source of several toxic air pollutants – responsible for half of mercury and more than half of acid gas emissions in the United States. In the power sector alone, coal-fired power plants are responsible for 99 percent of mercury emissions. Currently, more than half of all coal-fired power plants already deploy the widely available pollution control technologies that allow them to meet these important standards. Once final, these standards will ensure the remaining coal-fired plants, roughly 44 percent, take similar steps to decrease dangerous pollutants. The updated standards will provide a first-ever level playing field for all power plants across the country, ensure that they play by the same rules, and provide more certainty to business. The proposed rule provides up to 4 years for facilities to meet the standards and, once fully implemented, will prevent 91 percent of mercury in coal from being released into the air. I suspect the same job creation benefits apply to CWA regulations on surface mining, and even regulations that would limit CO2 emissions. Hopefully we can soon put to rest the “government regulations cost jobs” argument for good. These regulations are required by the Clean Air Act Amendments of 1990 (21 years old this November) signed by President Geoge Bush (the first Bush). The second Bush administration tried to do cap and trade but the Courts threw that out so now we finally (? )get this MACT. Mercury is biocumulative in the environment and goes up the food chain. The process is further enhanced by the presence of sulfur compounds such as those emitted from coal fired power plants and other combustion sources. Fresh water fish in many states should not be consumed by children or women who are pregnant or nursing due to the high mercury levels in the fish. Methylated mercury is the biological toxic form, extremely so. The methylaton of mercury does not occur everywhere and in some places, like the Everglades, it occurrs at a greater rate. Yes, sulfur is important to the mythylaton process and a significant source of it — much so for the Everglades — is from fertilizers applied to lawns and agricultural fields. Maybe I’m just feeling cynical today, but I suspect the reason our WV politicians haven’t jumped into the fray is that they haven’t gotten their game cards from the NMA and the other usual suspects yet – it’s hard to know what to screech when you have to ad lib it. Very ironic . Something is definitely WRONG with this picture …….During the same time period , we have a state-wide fish consumption advisory because of MERCURY in fish ! A lot of Mercury was spewed from the incineration of medical wastes, including human tissue. Our bodies are repositories for Mercury because we eat many critters. 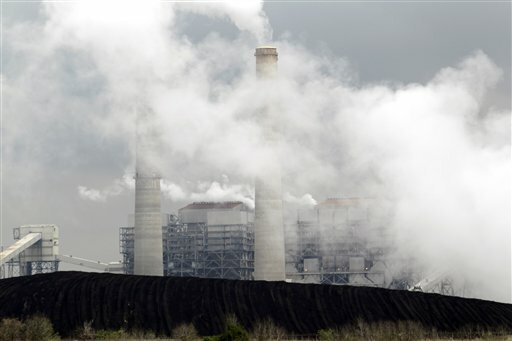 Coal fired power plants are currently the largest single source of airborne mercury emissions in the United States. Airborne mercury emissions travel tens to hundreds of miles before depositing, primarily in rainfall, into lakes and streams where it accumulates in fish that may be eaten by people. This adds to uptake via seafood consumption. The EPA recently announced that 1 in 6 women of childbearing age in the US have blood mercury levels that could be harmful to a fetus. The primary source of mercury is mineral deposits, which can filter into the freshwater system. But it can also enter in greater quantities through mining of mercury or as a byproduct of mining other metals. Recycling devices that use mercury in components, such as fluorescent lamps, cell phones and some batteries, can also introduce mercury into the environment. Coal-fired power plants introduce mercury into the atmosphere, and that mercury can be carried from as far away as China and deposited into the Gulf. Rumbold says on rainy days he doesn’t bother to sample Gulf mercury levels because they are exceptionally high from the mercury deposited by the rain. Finding the mercury, however, is just one piece of the puzzle. Another critical piece comes in the form of biomagnification, a multisyllabic word that means an increase in the concentration of a substance as it moves up the food web. Dr. Rumbold joined the faculty of the Coastal Watershed Institute at Florida Gulf Coast University in 2006 as an Associate Professor in the Department of Marine and Ecological Sciences. Prior to this he was a Lead Environmental Scientist coordinating mercury monitoring and research conducted by the South Florida Water Management District. He is a former recipient of an Environmental Science and Engineering Fellowship from the American Association for the Advancement of Science, during which he worked at U.S. EPA’s National Center for Environmental Assessment in Washington, D.C.
Just an interesting tie-in link. According to this website if a fish also has selenium in its tissue, it neutralizes the effect of mercury. Interesting. Maybe we should be adding selenium to rivers not removing it. Have fun. First link I came across. Here is one which is (at least purportedly) from two ph.d.’s at University of North Dakota. I certainly don’t know, but it is an interesting intersection of two elements which are in the news. exposed populations remains unanswered. However, even if there is increasing evidence that Se can offset some toxic effects of Hg, it may be inefficient against all Hg-mediated effects. Preventive actions should continue to focus on reducing Hg exposure rather than increasing Se status.